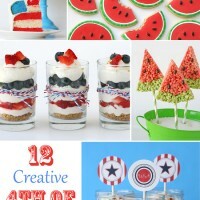 As we head into the weekend, I imagine many of you are thinking of fun 4th of July celebrations for next week! 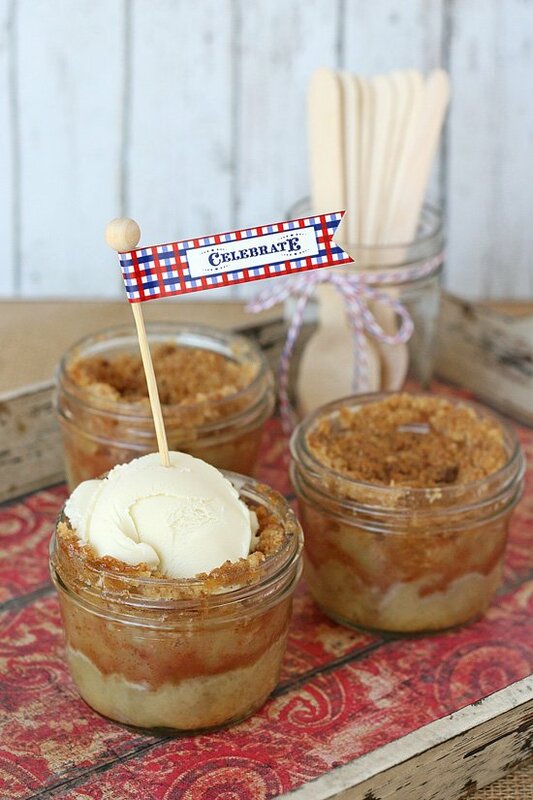 This cute and delicious Apple Pie in a Jar just might be the perfect treat to add to your picnic or BBQ menu. These classic little pies start with a buttery pastry crust, are packed with sweet and tart cinnamon apples, and then topped with a delicious crumb topping. 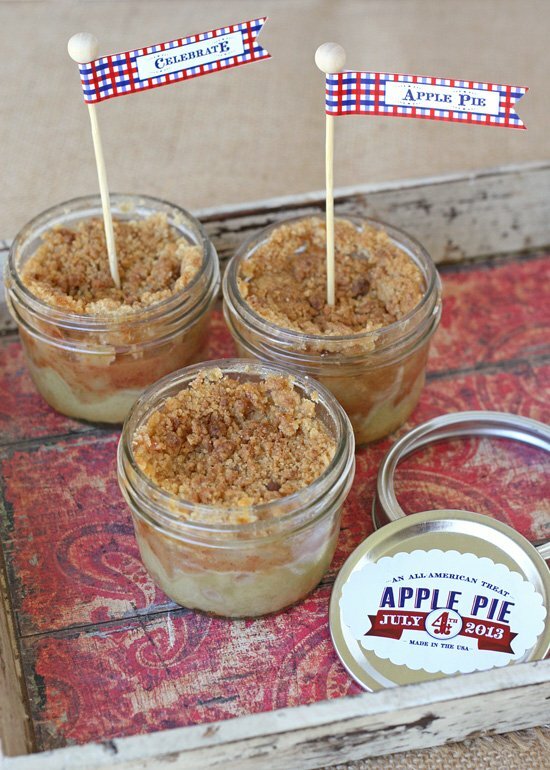 These little pies in jars are perfect to pack up and take along with you to any 4th of July celebration. If you’d like, you could certainly use this same recipe to make one large pie (I have in the past and it’s always a hit). Add some extra special details to the pies with red, white and blue bakers twine (from Shop Sweet Lulu), and wooden spoons (from Shop Sweet Lulu). Top the pies with custom labels and flags, which are both a free printable designed by Loralee Lewis and available through Layla Grayce HERE (link to printables is at the very end of the post). 1. Thaw the pie crust (if using frozen), or prepare pie crust. Please note, frozen pie crust sheets usually need to thaw several hours. 2. Use the ring from the lid of the jars to cut 6 circles of dough. Place one circle of dough into the bottom of each jar and use your fingers to press the dough into the bottom of the jar and up the sides a bit. 3. Fill jars with cinnamon apple pie filling (following recipe below). Pack the apples in as tight as you can. The apples will shrink down a lot during baking. 4. Top cinnamon apples with 2-3 tablespoons crumb topping, pressing down a bit, as needed. 5. Bake as directed in the recipe below. *Note, you may notice I have 7 jars shown in the how-to photos above, but I found the apples shrunk down so much in baking that packing the apples into 6 jars produced a prettier final pie. The images shown in this post of the finished pies were from a batch that was divided into 6 jars. A delicious classic crumb topped apple pie, perfect as a standard sized pie, or made for easy serving and travel in small jars. 2. Preheat oven to 375*F.
3. Use the ring from the lid of the jars to cut 6 circles of dough. Place one circle of dough into the bottom of each jar and use your fingers to press the dough into the bottom of the jar and up the sides a bit. 4. Peel and chop apples and place in a large bowl. 5. Add lemon juice and toss to coat well. 6. Add both sugars, flour and spices and stir to fully coat apples. 7. Scoop apples into the prepared jars, pressing the apples in as tightly as possible. Divide the apples between the 6 jars. 8. Prepare the crumb topping by combining all ingredients and mixing together with a pastry blender, or fork until the butter is in small pieces and the mixture is crumbly, yet well combined. 9. Top each jar of apples with a generous portion of crumb topping, pressing down a bit as needed. The apples will cook down quite a bit while baking, so you want to start with full jars. 10. Bake the jars on a large baking sheet (because the pies will likely bubble over a bit while baking). Bake 35 minutes at 375*F.
11. Cool at least 20 minutes before serving. Serve as is, or with a scoop of vanilla ice cream on top. The pies may be made up to two days in advance. Keep covered and in the refrigerator when storing for more than 1 day. Serve at room temperature, or heat for 20-30 seconds in the microwave before serving. mh yam. i just got some little jars to fill with some yumminess for an upcoming picknick and just didn’t know what yet. these apple pies are perfect. thanks. I think I could eat about a million of these! I kid you not, I called my mom a half hour ago to ask if she still had all the mason jars I bought because I wanted to make apple pies in a jar. I went online to find a recipe, but before I began my search I checked my reader and low and behold, this recipe pops up! Serendipitous! 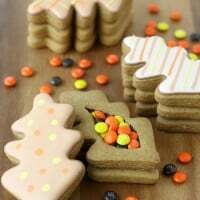 I’m going to be making these tomorrow, they look perfect! Cute. Too cute!! I am nuts over anything in a jar! 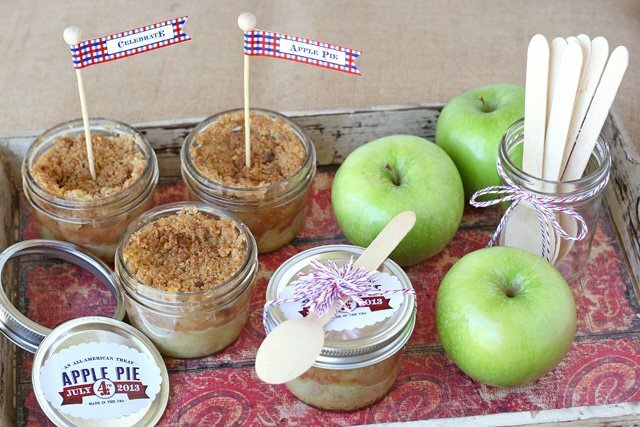 Love jar pies and apple is one of my favourites. I adore your labels and little checkered banners. These sound delicious and I love the super cute packaging! 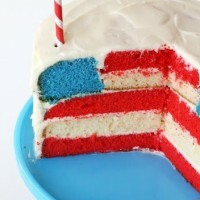 What a fun treat to bring to a 4th of July barbeque! Thank you for sharing! I did a similar recipe using a muffin tin with my first grade class. I am following you on bloglovin! 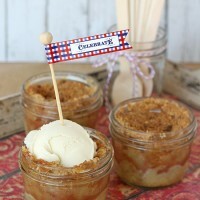 These pie jars look amazing, I love the last pictures as I like to eat my pie with ice cream. I absolutely love this idea, it looks amazing and really tasty!!!!! I recently made red velvet jars and before that rainbow jars.. and I think I´ll be making many more jar desserts in the future.. whoever thought of it first is a genius..lol! I so love anything in jars. I’m also in love with apple pie, so these are perfect! Very cute! I like how the scoop of ice cream fits perfectly in on top! Love you! Hi Sarah, I’m not sure if I would recommend these to last more than a few days (without being frozen or refrigerated). I think the moisture from the apples would cause the dessert to go bad after a few days (without refrigeration). Do you have to spray the jars with anything so the apples won`t stick? Nope, you should have no problem with them sticking. Happy baking! Hi! Thanks for the recipe and the beautiful pictures. Question- Where do you get the jars? I’ve look into these, and the ones I’ve found state that they only handle temps. up to 250 degrees F.
I usually buy them at Wal-Mart, but target sometimes has them, as does some hardware stores and grocery stores. They are canning jars, so they will be with other canning supplies. The jars shown are 1/2 pint wide-mouth jars. I made these the other day and they are so good. I am doing a fundraiser bake sale in September and I will be making the Apple and other varieties to sell. Thanks for sharing. I made 10 jars with these ingredients. These are so stinkin’ cute! I have a huge inventory of these very jars (which weren’t easy to find, by the way), but I make lots of cupcakes in jars, so that’s why I have them. Looking forward to making some yummy single serve apple pies this fall. Thanks for this great idea! Have you ever used peaches? Could these be frozen (unbaked) and baked later? I’m thinking I’d like to bring these for Christmas but really don’t want to be baking the day before. Hey. 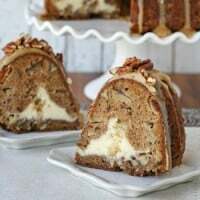 This looks amazing and I want to make them! How should they be kept after making? Refrigerate? How many days will they hold up? Made these last night and served with a small scoop of vanilla ice cream. Great concept and everyone liked it until they got to the “crust” at the bottom. It was soggy and not quite cooked through. Nect time I make these I will cook the crust for a few minutes before putting the rest of the ingredients into the jar. I am positive this would make them much tastier. Does the crust get soggy? Should I bake the crust first for a bit before I add in the other ingredients? ?